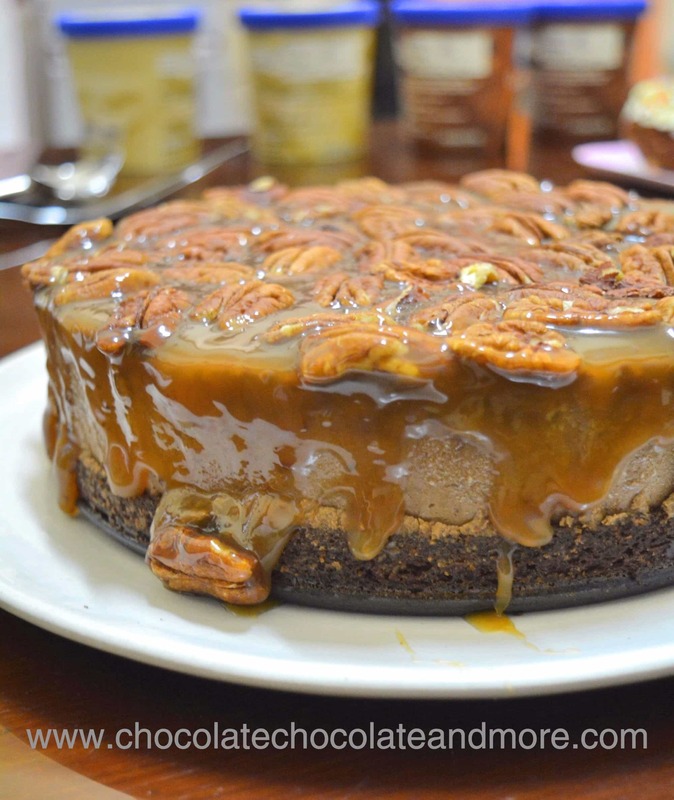 Brownie-Bottom Praline Chocolate Mousse Cake - Chocolate Chocolate and More! 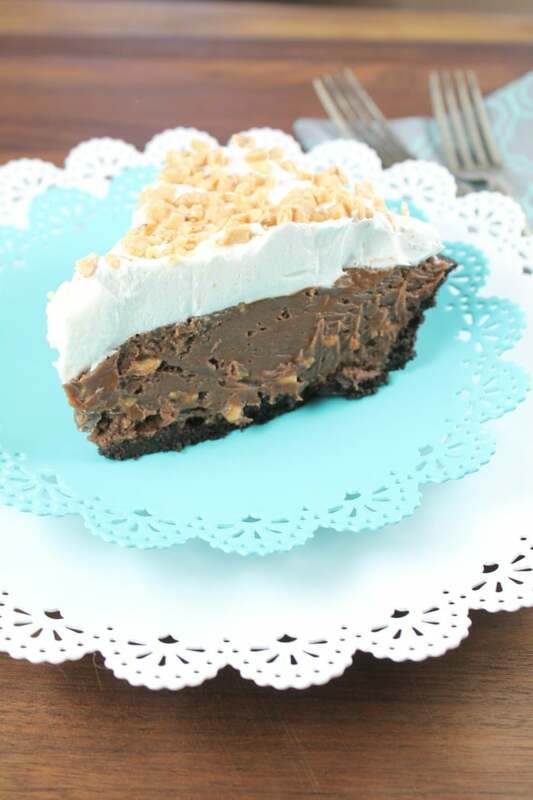 The rich, creamy, chocolate mousse in this Brownie-Bottom Praline Chocolate Mousse Cake only requires two ingredients. If you use a few store-bought ingredients, you can throw this show-stopper together in less than an hour. Father Kevin’s birthday was this week. He’s a sweet guy from Ohio who works with the mentally ill in Cambodia. Anyone here over the age of 35 has PTSD from years of war and oppression under the Khmer Rouge. With no governmental agencies addressing mental illness, Father Kevin and his staff fill a big need here. It was a busy week but I wanted to make something special. I lucked out at the grocery store. They had brownie mix for $2.50 a box. It’s normally double that. So I stocked up. I had a big container of mascarpone cheese, dark chocolate (of course) and pecans. There’s only one store that sells pre-made caramel sauce so I made my own. It’s easy but you can speed things up with a jar of caramel ice-cream topping. 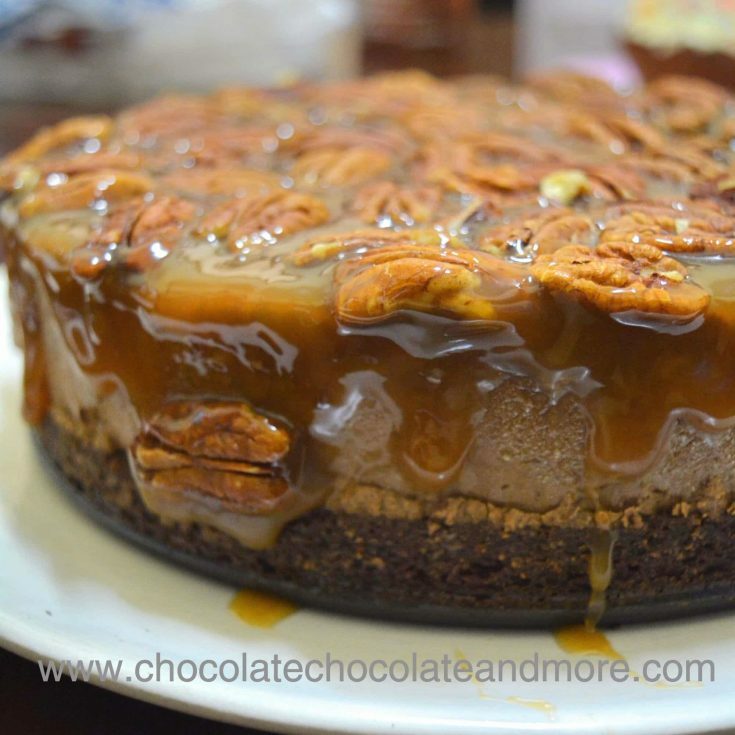 So there are four layers in this Brownie-Bottom Praline Chocolate Mousse Cake. The brownie bottom is from a mix but feel free to substitute your favorite brownie recipe. The next layer is a decadent chocolate mousse. Then a bourbon caramel sauce and finally pecans. The mousse is sooooooo easy to make and it could be served in so many ways. If you want to make the most decadent pudding pops ever, freeze this mousse in your popsicle molds. Or, pour it into ramekins, chill and top with whipped cream for pot au creams. I added some bourbon to the caramel sauce. I’m not a huge whiskey fan but bourbon goes well with caramel and chocolate. You can add it or leave it out as you wish. 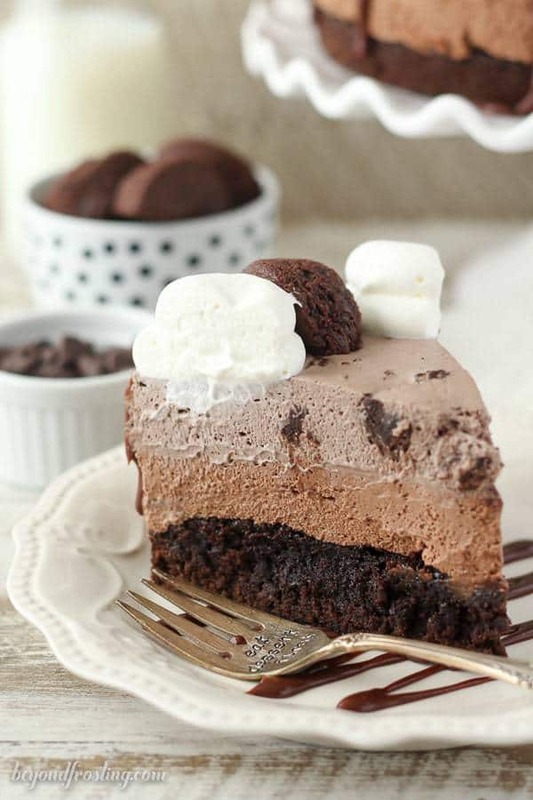 The chocolate mousse does need some time to firm up so you will need to refrigerate your Brownie-Bottom Praline Chocolate Mousse Cake for several hours before you serve it. I put mine in the freezer for two hours. This was enough to make it firm but not frozen. 1 box brownie mix prepared according to package instructions. Grease the bottom and halfway up the sides of an 8-inch springform pan. Prepare brownie batter and bake according to instructions for a 9 x 13 inch pan. Let cool. Boil some water in a pot large enough to place a heat-proof mixing bowl in. Ideally, the bottom of the mixing bowl will sit above the hot water. Place the mixing bowl in the pot and add the chocolate. Let sit for 3 minutes and then stir until full melted and smooth. Remove the bowl from the pot and stir in the mascarpone cheese. Mix until uniform. Pour over cooled brownies. Place in freezer while you make the caramel sauce. It's important to have all your ingredient ready for this before you start cooking because you must work quickly at the end. Place sugar and corn syrup in a heavy 2 quart saucepan. Heat over medium heat until the mixture starts to boil. At this point you need to watch the boiling sugar carefully because stoves vary. The boiling mixture will go from clear, to light yellow to golden brown to medium brown. When the boiling sugar turns medium brown (a little darker than store bought caramel), remove from heat and add the cream all at once. You will need to stir vigorously and the mixture will boil up quite high (which is why you need the big pan). Be very careful during this phase. Professional chefs keep bowls of ice-water on the counter when they make caramelized sugar just in case they burn themselves. If desired add the bourbon to the hot caramel. It will also boil up (and cook off most of the alcohol). Stir while the caramel sauce cools and thickens. When the sauce is very thick, pour over the chocolate mousse. It will still be hot so pour carefully and not all in one spot so you don't make a hole in the mousse. 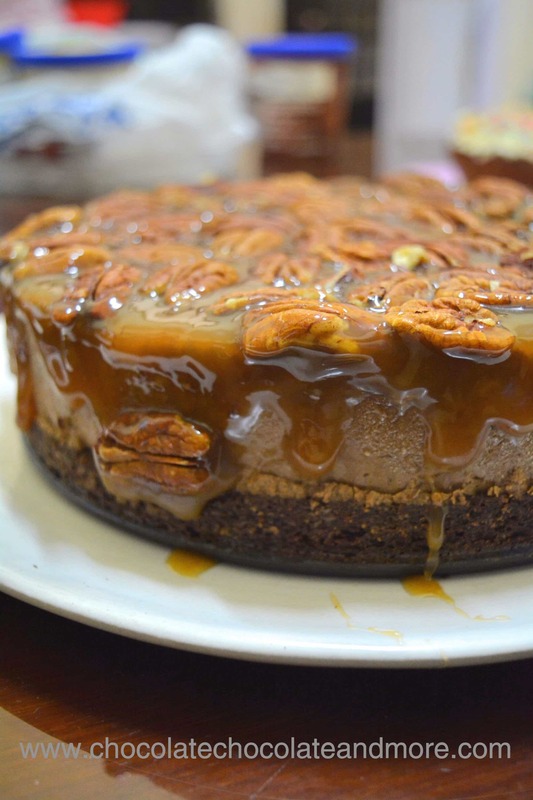 Arrange whole pecans over the top of the cake and return to the refrigerator (if you want to cool over night) or freezer (if you are serving the same day). When ready to serve, remove sides of pan and place the cake on a serving dish. Dip a knife in hot water to cut the cake cleanly. 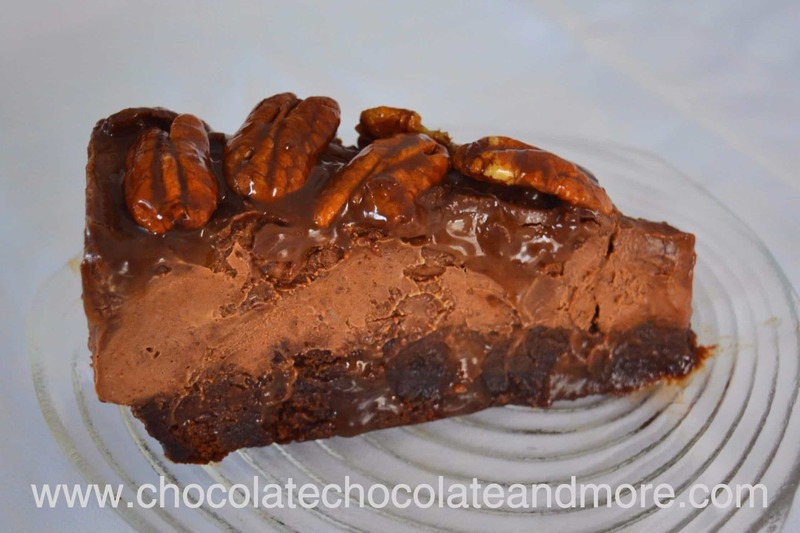 This cake can be made in a deep rectangular pan (9 x 13) and served as bars. The brownies do not need to be fully cool when you pour the mousse on top but the mousse needs to be semi-solid before you pour the hot caramel on top. You can substitute store-bought caramel sauce to save additional time. This looks epic, can’t wait to try! Thanks James. Let us know how yours turns out! Appreciate your creations very much ! Thank you for this one ! Thanks so much. I hope you enjoy it! Thanks Cindy. If your kids are young, you can leave the bourbon out of the caramel sauce. I love how quickly it came together!